We are excited to announce Slice and Dice! This new feature enables teams to apply filters on the service metrics to diagnose the issues quicker. 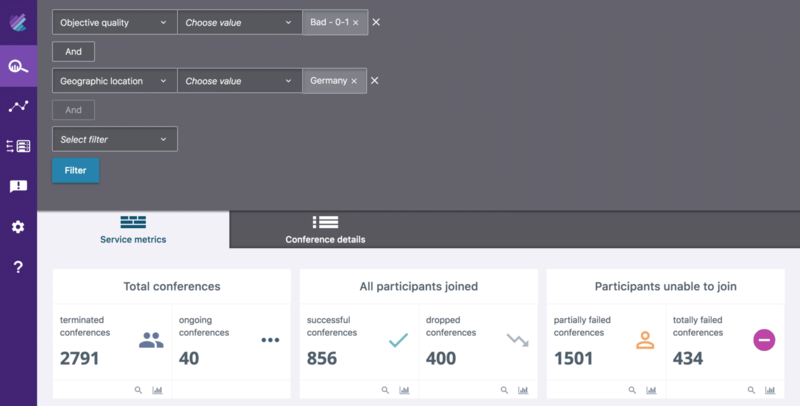 Once the filters are applied, you can select the conference details tab to analyze the individual conferences. We are in the process of adding more filters. To stay updated, subscribe to our monthly newsletter. An end user with a certain Operating System version (i.e. Mac 10.13) is complaining about call failures. As a service provider you might not have access to Mac 10.13 to verify the issue immediately. You can use our “Operating System” filter and find all the conference with Mac 10.13. This would allow you to look at the issues pertaining to that Mac 10.13 and drill deeper into those calls. End users from Germany are complaining about bad QoE but end users from other EU locations are happy with the service. Using the “Geographic location” and “Objective Quality” filters, you can analyze the calls from Germany with low objective quality over the last 2 weeks and single out the issues causing the poor QoE. Different customer personas can make use of the “Slice and Dice” feature. As a product manager you are able to measure the KPIs such as customer engagement in certain geographic locations, most used application versions, etc. As a developer you are able to segregate the most common factors contributing to the QoE, Issues specific to OS/App/Browser versions, etc. As a customer support person, before escalating a single customer support ticket you can evaluate how many customers are affected by the same issue. All in all, these filters allow you to save more debugging time and develop a better WebRTC-enabled audio and video product so that you can create better user experiences for your customers.